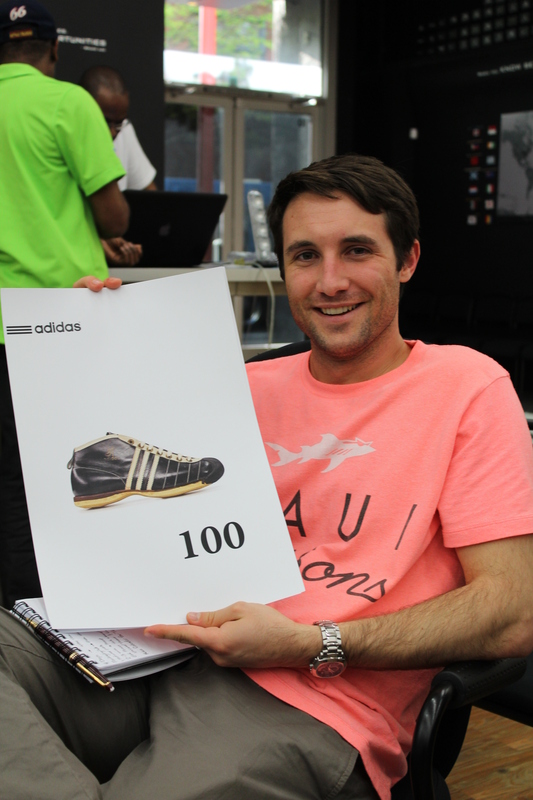 Mark Hummel represents team Adidas. 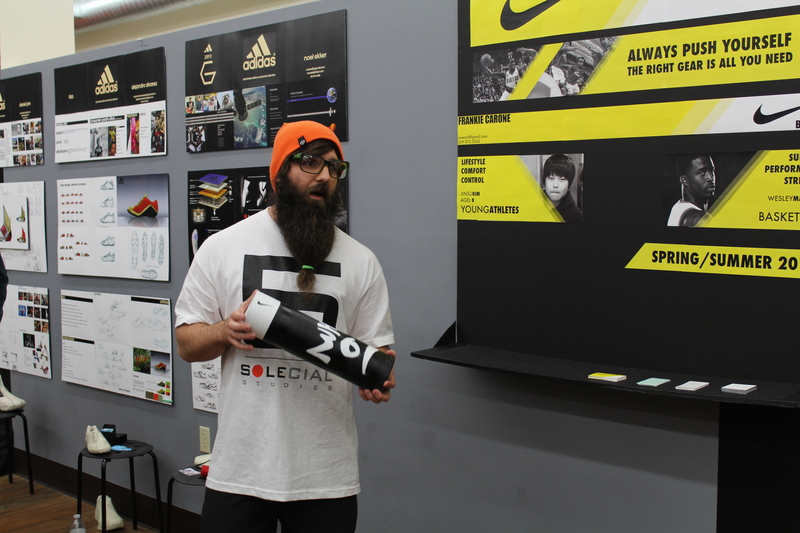 Frankie Carone presents packaging concepts and brand story for Nike. 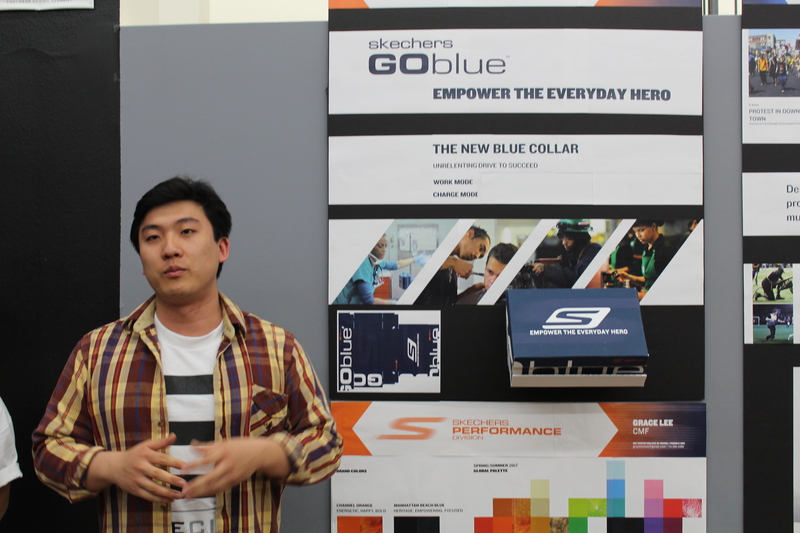 Vincent Zhang introduces brand story and packaging for Sketchers. 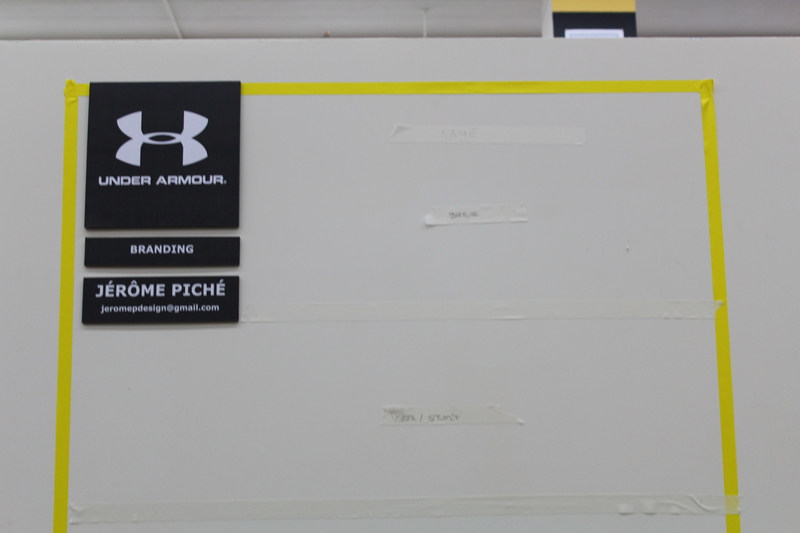 Jerome Piche talks about retail possibilities for Under Armour. 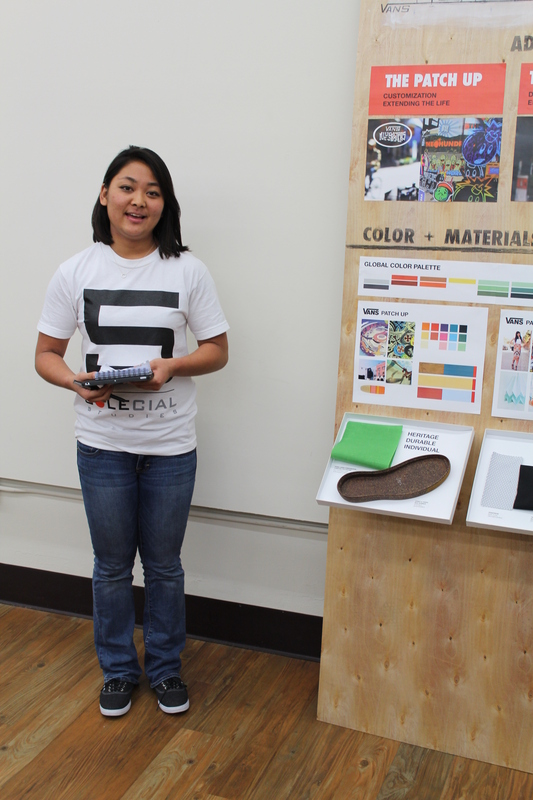 Lori Nishikawa shows off her branding concept for Vans. 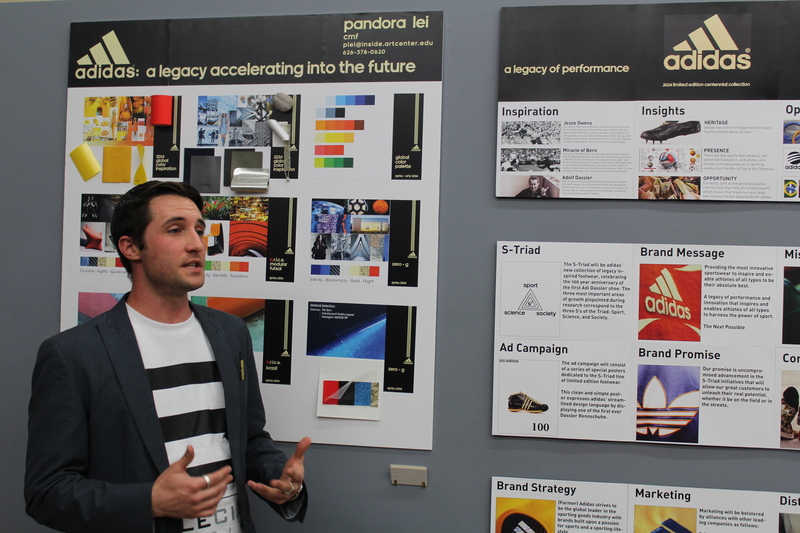 The Brand Corps put long hours into their research, concepting, and presentation designs, which were well-received by industry representatives. 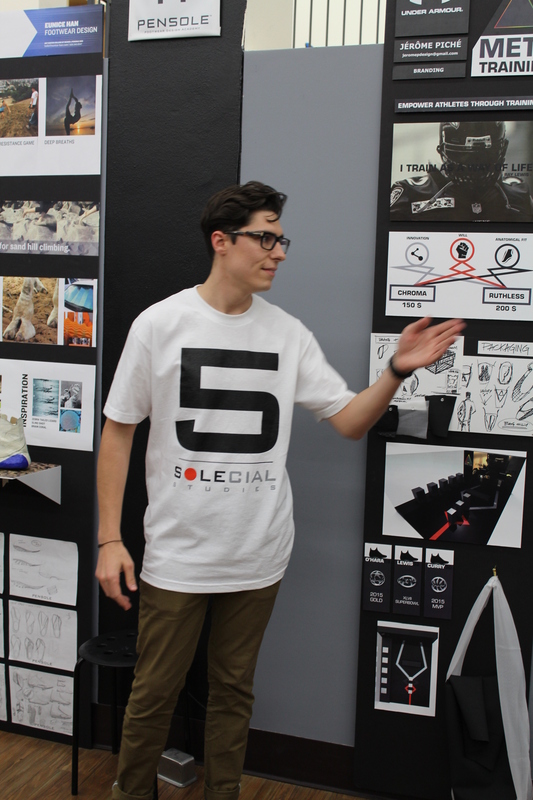 Congratulations to the inaugural class of brand designers, and many thanks for all of your hard work! 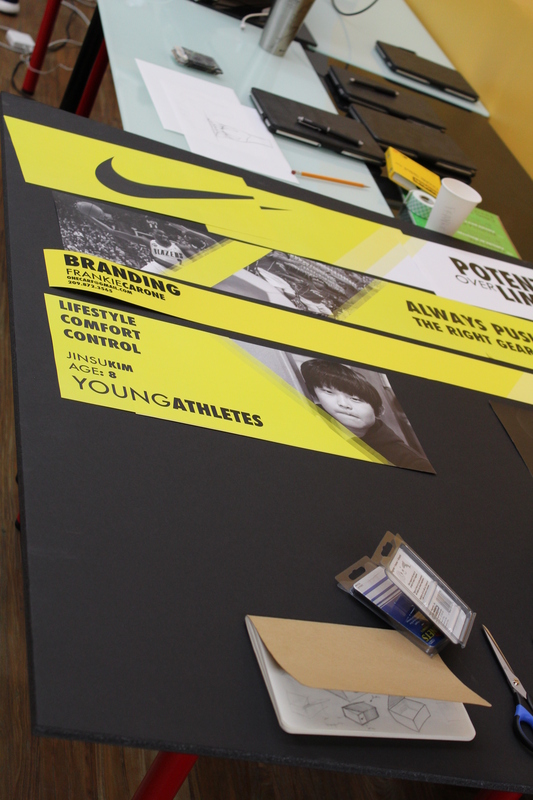 Brand Corps pulling it all together for the final presentation! 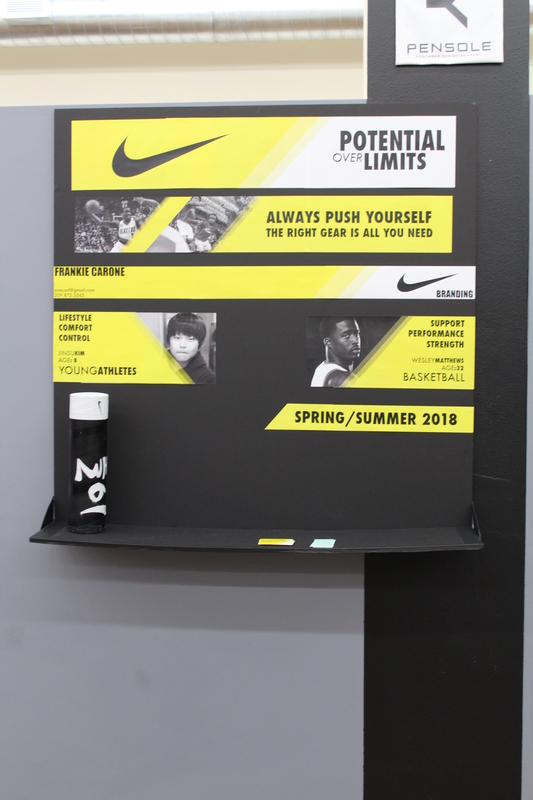 Frankie Carone working on a packaging concept and brand board for team Nike. 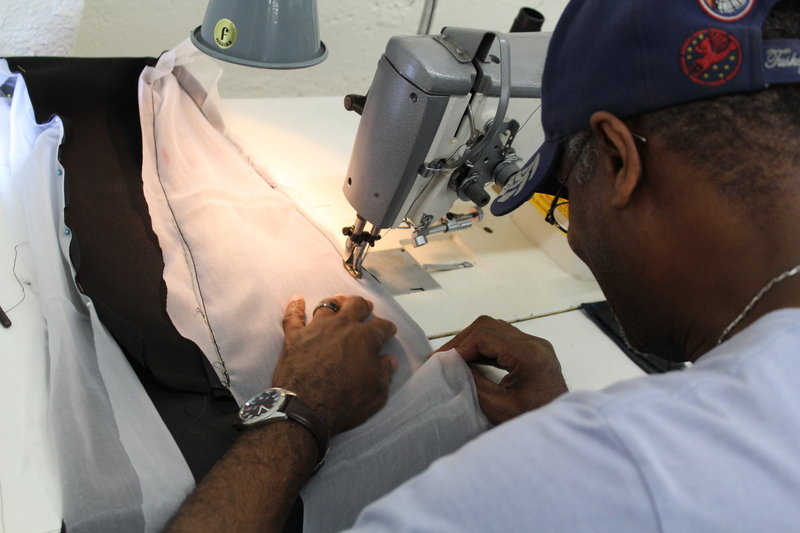 Jerome Piche and team Under Armour work with our resident expert Eustace Robinson on the industrial sewing machine to fabricate a bag for their packaging concept and fine tune some presentation graphics. 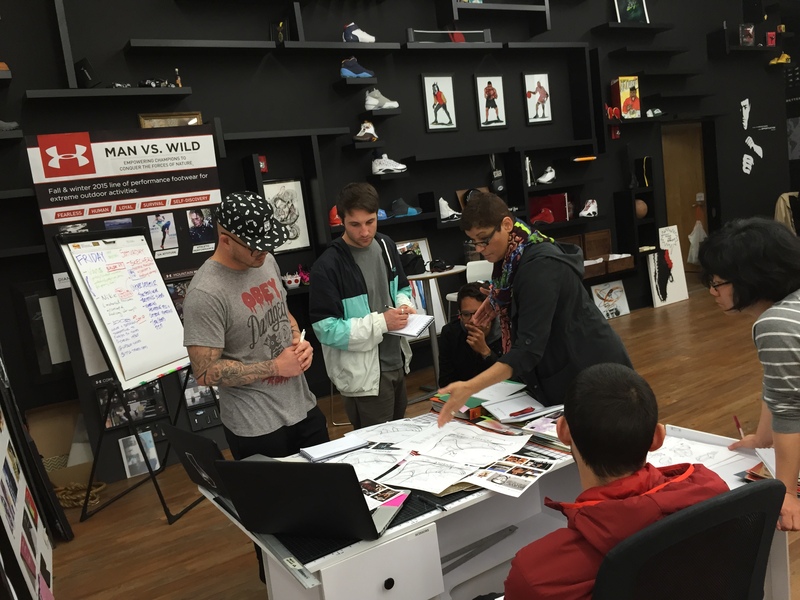 Mark Hummel and team Adidas working out some graphics and layout. 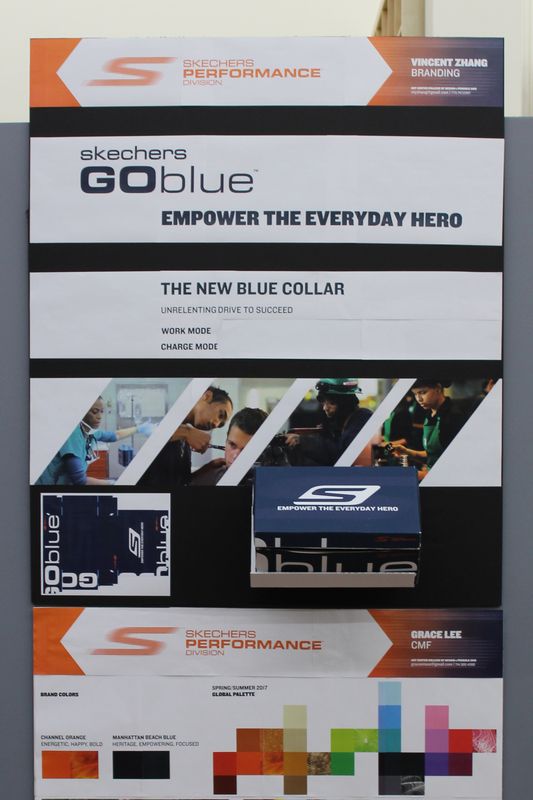 Vincent Zhang’s packaging graphic for team Sketchers. 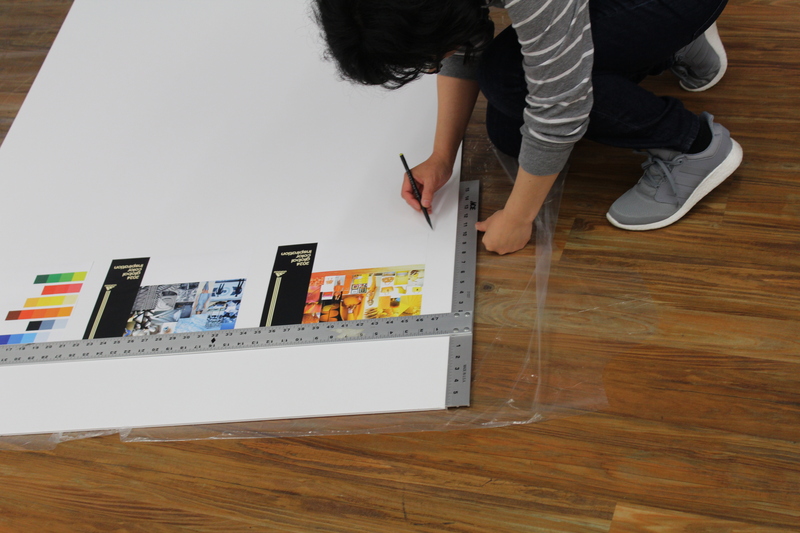 Lori Nishikawa and team Van prepping their boards. The Patch Up Shoe related to the Illuskate theme is targeted to be released in 2018. 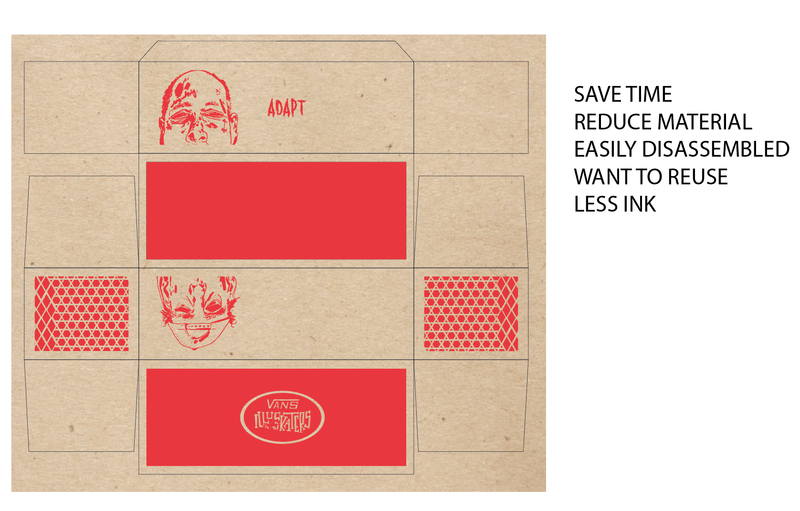 That means that not much of the packaging can be changed, but there are still a lot of room in order to save on ink, size and volume. This new packaging I’m proposing has no tissue and shows off Zack’s “illuskations” to promote Illuskate. Here is the existing shoe design. It is all silkscreened in the classic Vans red and so I’m proposing just a different print on top. 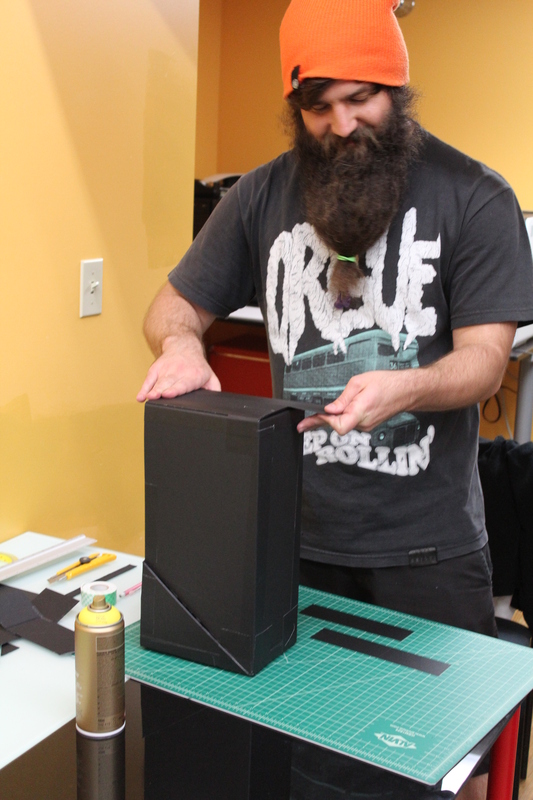 We are still in prototyping phase but I really would like to redesign the box so people would want to reuse it after they take the shoes out. Our positioning on Vans currently is ADAPTING TO THE PRESENT. 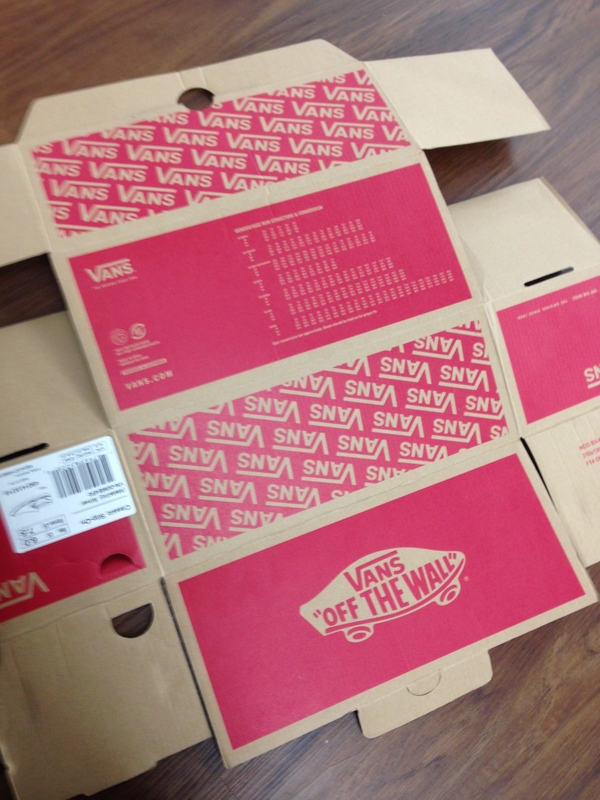 Vans is promoting sustainability but the consumers might not resonate with that terminology. They do however relate to adapting to the streets, to their world, culture and all the things that life throws at them. Currenly, Vans is trying to appeal to a lifestyle but have strong roots in the skater appeal so Illuskate helps promote those who do “Adapt to the present” because they are the ones who express themselves out loud and set the trends. Currently I am working on a website for the ILLUSKATE theme. 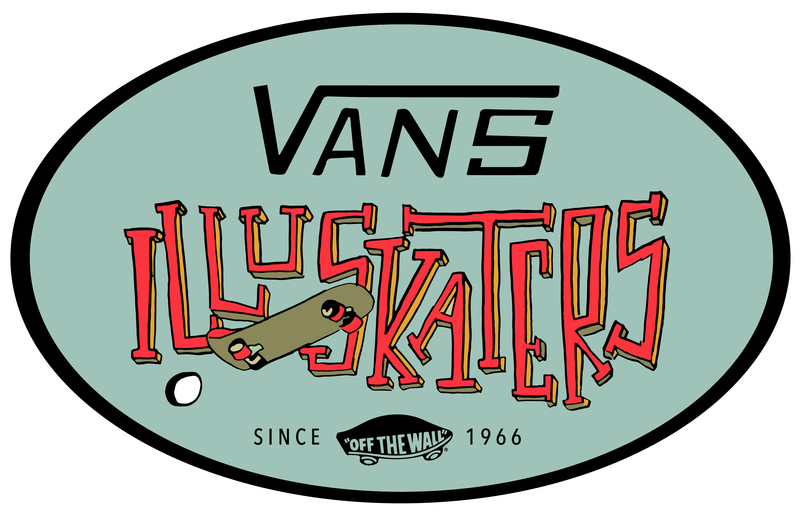 The concept of illuskaters are illustrators + skaters who are promoted by Vans in order to sell their art via patches. Here we are promoting local illustrators in conjunction with the shoe design which patches up the shoe in order to prolong the life of the shoe itself. 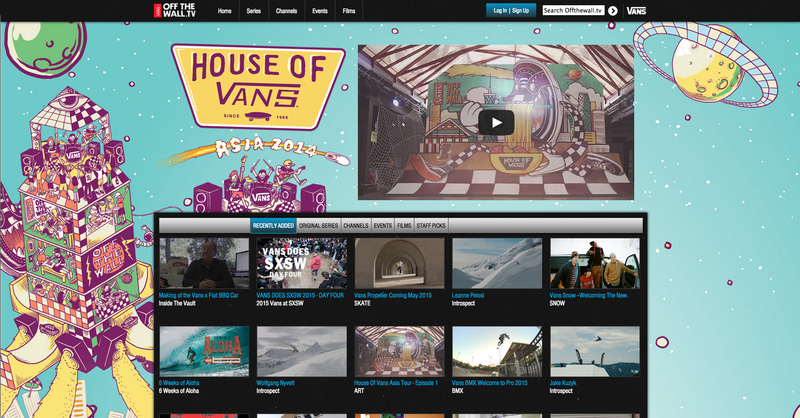 In order to start designing for Illuskate I was looking at how House of Vans website is set up and the case study of Vans US Open of Surfing hire local artists from the community to bring life to Vans skatepark. The great thing about Vans as a brand is the authenticity that they bring from the street culture. 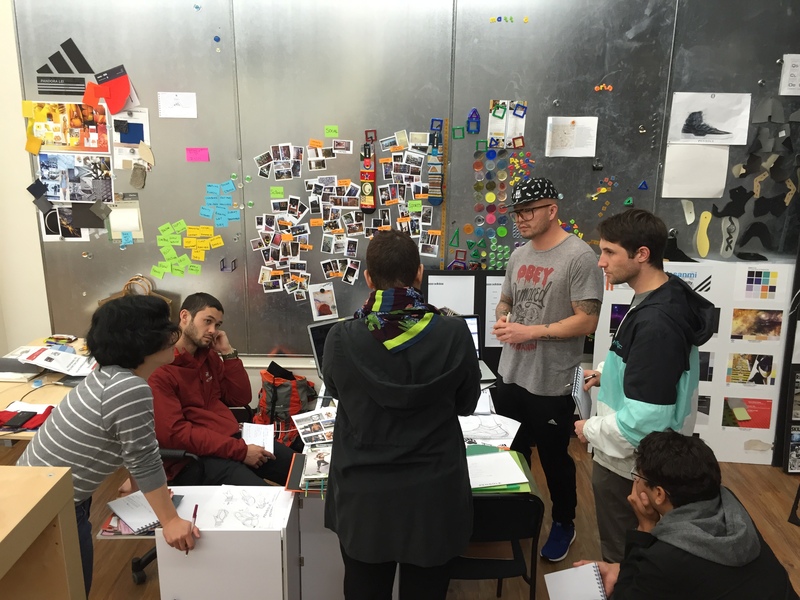 It’s more about the lifestyle of the creatives than anything else. 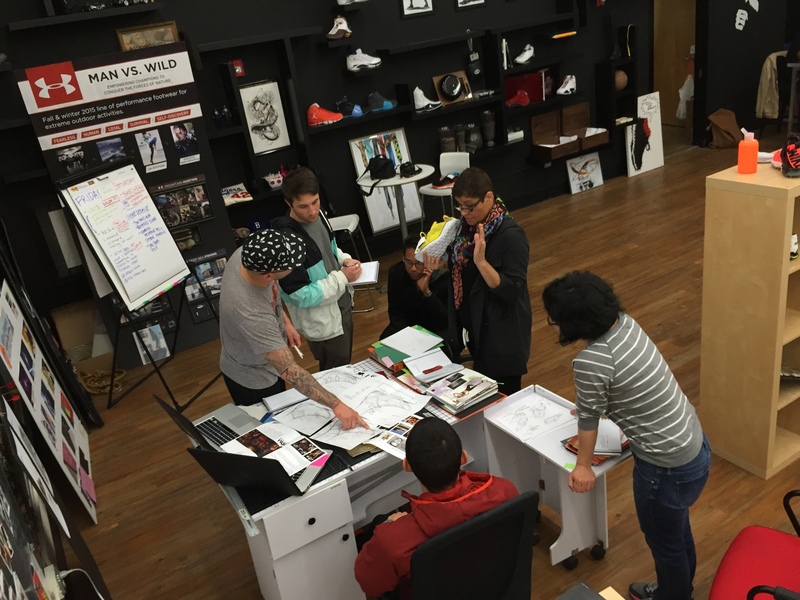 Above are Zack Mendoza (Vans footwear designer on our team) and Lori Nishikawa’s (Branding) friends works. 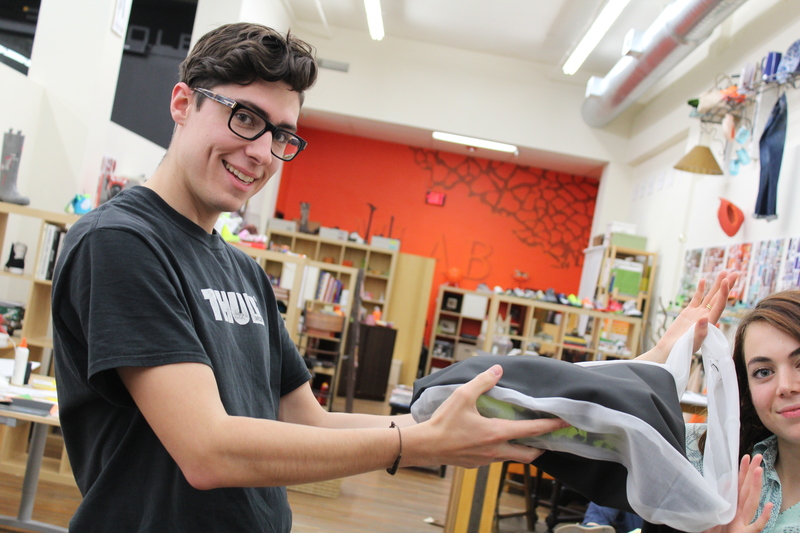 They would be sold on the illuskate website as patches for the users to restore their shoe back to shape after they get worn or tear. 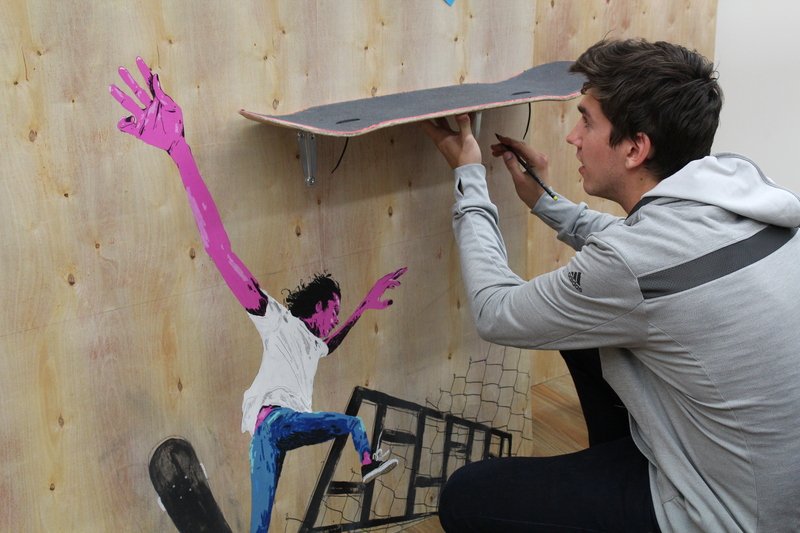 It also takes the culture of slapping on stickers onto the skateboard deck and translates it onto the shoe. Shoes aren’t a fragile thing when you’re skateboarding. In fact, tears are somewhat like battle scars and should give them pride that they have gone through a lot. 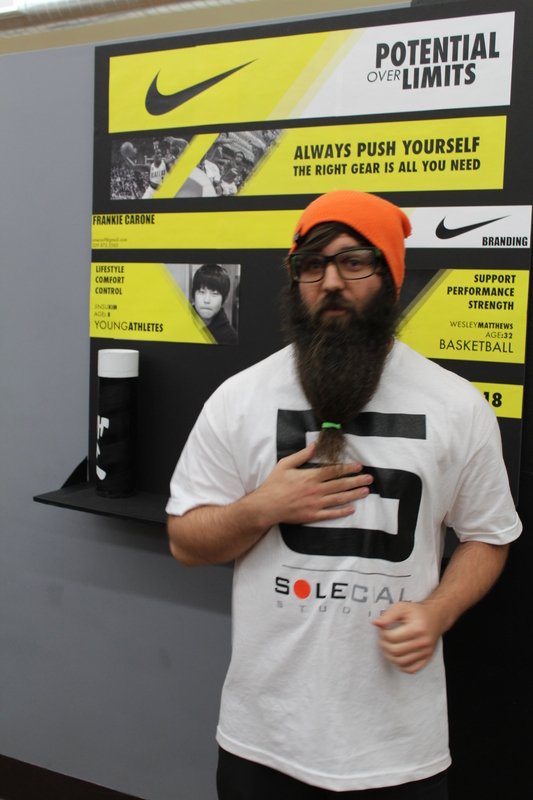 Our hope is that these patches can help extend the life of the shoe while giving the consumers more ownership and customization of their product. 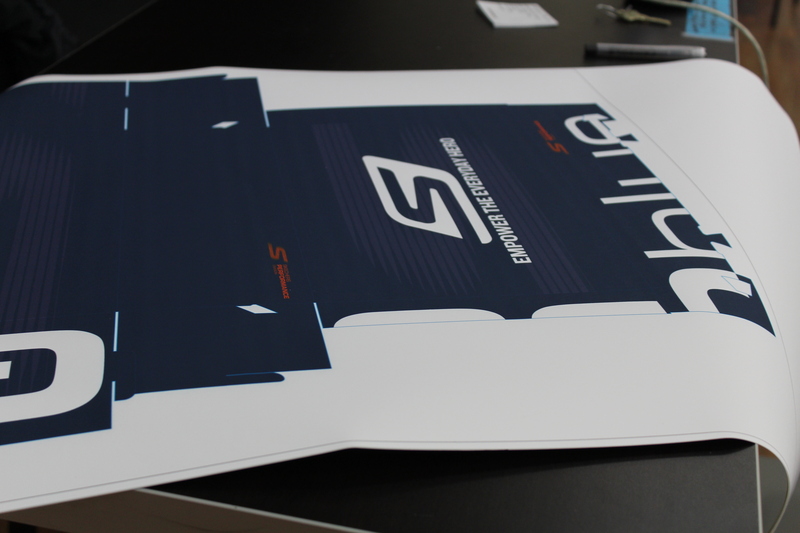 This is just one of the concepts we have in the works currently and are working on two others in parallel to this. 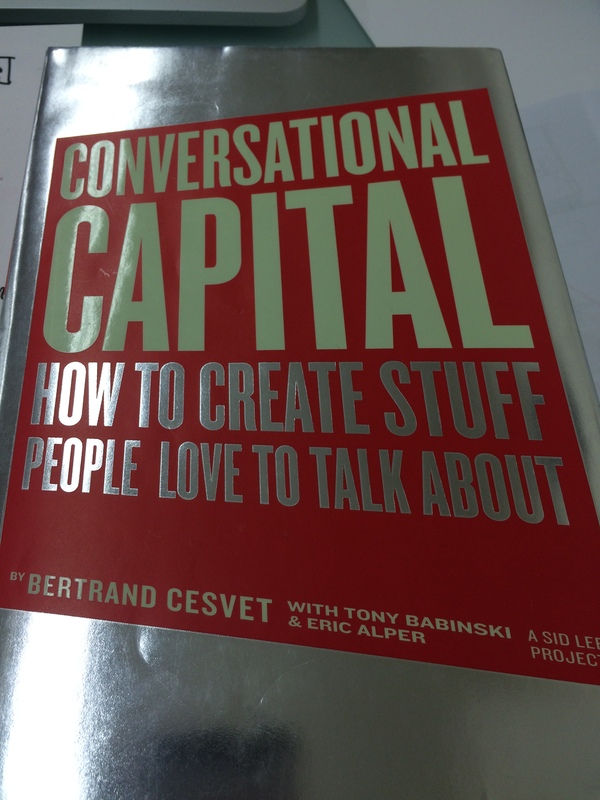 It’s not only a website, it’s a book. 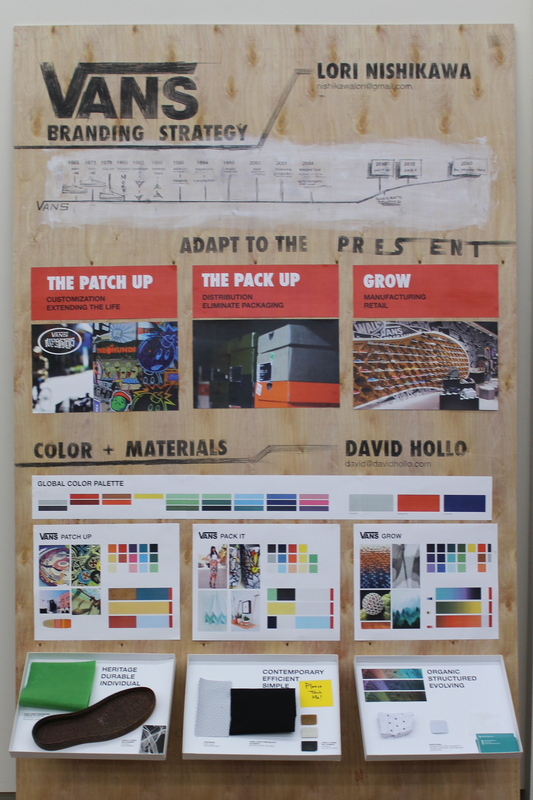 It helps you understanding the basics of a brand. 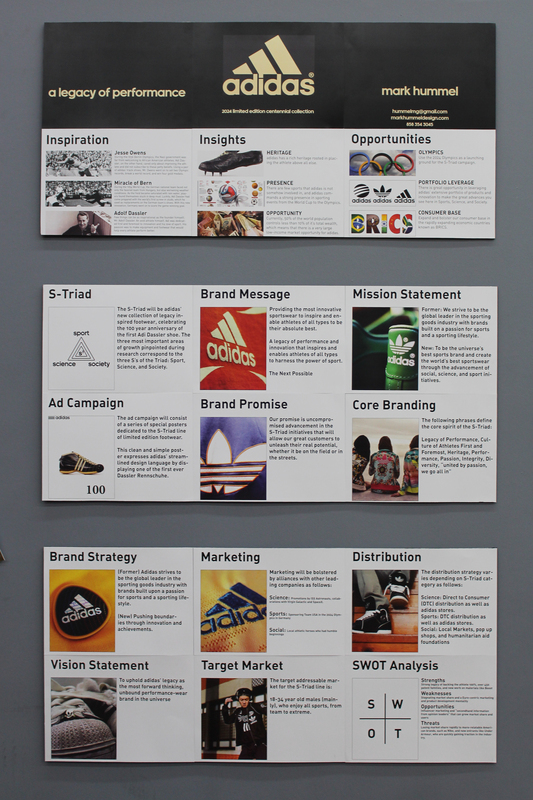 How a brand should be build and how you should communicate your message. It gives you example on the most successful brands in the world and what they’ve done to position themselves where they are. The 8 engines that the authors give are really helpful when you are building something from scratch. 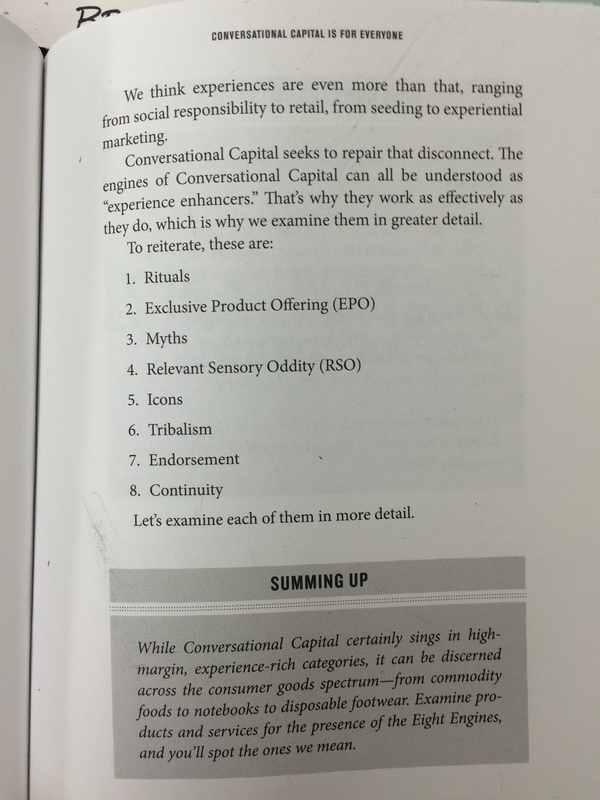 However, it is also a good tool to look if your brand is missing something or not. 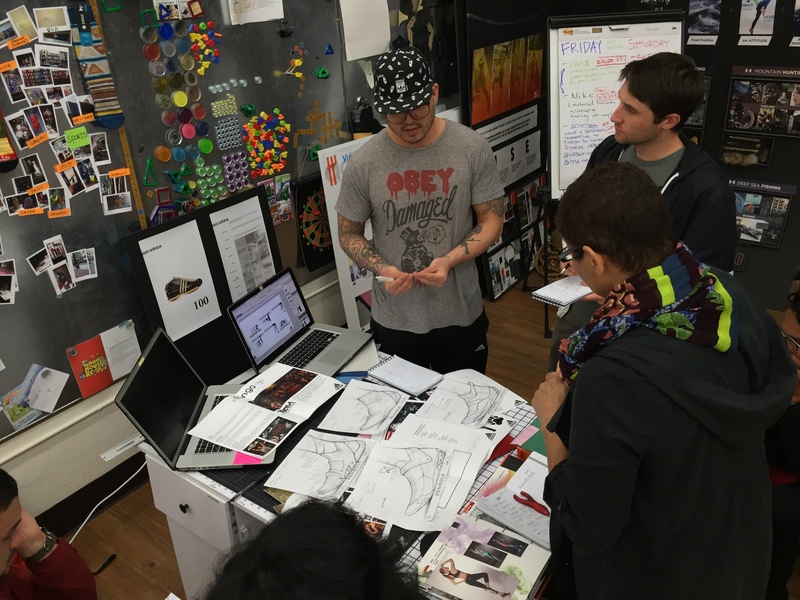 Team adidas (Alejandro Alvarez, Daniel Yim, Pandora Lei, Noel Ekker, and Mark Hummel) are working with CMF instructor Suzette Henry to nail down a logical and consistent brand message through the use of specific colors, materials, and finishes. All three of these will ultimately work together to help tell our 100-year celebratory story. The lynchpin is a futuristic gold we have named ‘Legacy’.